SAN DIEGO, Jan. 15, 2019 /PRNewswire/ -- Realty Income Corporation (Realty Income, NYSE: O), The Monthly Dividend Company®, today announced its Board of Directors has declared an increase in the company's common stock monthly cash dividend to $0.2255 per share from $0.2210 per share. The dividend is payable on February 15, 2019 to shareholders of record as of February 1, 2019. 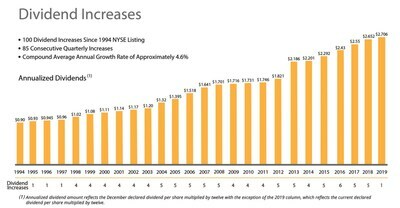 This is the 100th dividend increase since Realty Income's listing on the NYSE in 1994. The ex-dividend date for February's dividend is January 31, 2019. The new monthly dividend represents an annualized dividend amount of $2.706 per share as compared to the current annualized dividend amount of $2.652 per share. "The continued strength of our operating performance has allowed us to increase the dividend for the 100th time since our company's public listing in 1994," said Sumit Roy, President and Chief Executive Officer of Realty Income. "We continue to maintain a conservative payout ratio and remain committed to our company's mission of paying dependable monthly dividends that increase over time. With the payment of the February dividend, shareholders will realize a 3% increase in the amount of the dividend as compared to the same month in 2018." Realty Income, The Monthly Dividend Company®, is an S&P 500 company dedicated to providing shareholders with dependable monthly income. The company is structured as a REIT, and its monthly dividends are supported by the cash flow from over 5,600 real estate properties owned under long-term lease agreements with regional and national commercial tenants. To date, the company has declared 583 consecutive common stock monthly dividends throughout its 50-year operating history and increased the dividend 100 times since Realty Income's public listing in 1994 (NYSE: O). Additional information about the company can be obtained from the corporate website at www.realtyincome.com. Statements in this press release that are not strictly historical are "forward-looking" statements. Forward-looking statements involve known and unknown risks, which may cause the company's actual future results to differ materially from expected results. These risks include, among others, general economic conditions, local real estate conditions, tenant financial health, the availability of capital to finance planned growth, continued volatility and uncertainty in the credit markets and broader financial markets, property acquisitions and the timing of these acquisitions, charges for property impairments, and the outcome of legal proceedings to which the company is a party, as described in the company's filings with the Securities and Exchange Commission. Consequently, forward-looking statements should be regarded solely as reflections of the company's current operating plans and estimates. Actual operating results may differ materially from what is expressed or forecast in this press release. The company undertakes no obligation to publicly release the results of any revisions to these forward-looking statements that may be made to reflect events or circumstances after the date these statements were made.